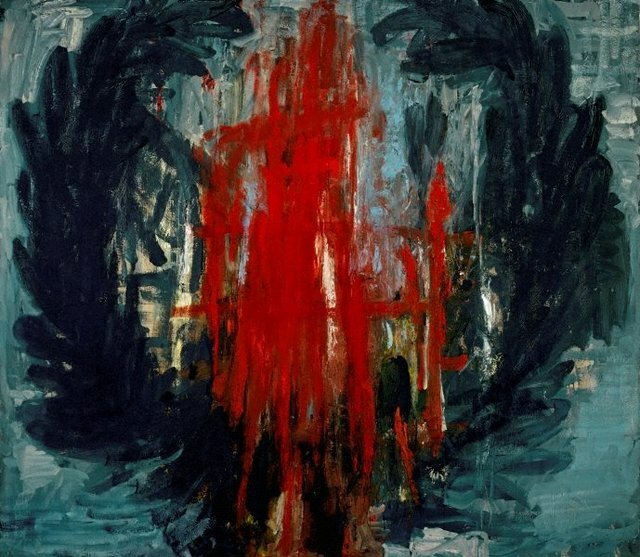 Living in Berlin from 1987 to 1988 as a visiting artist, Christopher Le Brun came in contact with several of the Neue Wilden painters1 and later met Anselm Kiefer. Like Kiefer, Le Brun’s use of mythological subjects and expressive painting came at a time of renewed interest in expressive figuration in Europe. Drawing inspiration from European myths and folk tales, Le Brun likens himself to a visionary painter after Joseph Turner or William Blake incorporating imagery and symbolism from literary and poetic sources such as Keats, Blake, Woolf, Joyce and the French symbolist poets. The poetry of Ezra Pound, in particular his ability to place ‘an exquisite image in a sea of language’,2 also made an impact on the young Le Brun. Several motifs appear repeatedly in Le Brun’s paintings: the winged horse, trees, wheels and the wreath, as seen in ‘Untitled (wreath II)’. The wreath, or garland, represents a duality of meanings: in life, superiority or sanctity and in death, resurrection or immortality.4 In ‘Untitled (wreath II)’, the laurel wreath is open-ended, signifying victory and the god Apollo, rather than a fully circular wreath of death, eternity and remembrance. The paint, which Le Brun attempts to keep fluid until the conclusion, is violently imposed on the canvas, shifting and squirming as if ready to evolve into another image. This sense of an imminent metamorphosis is reinforced by the intensity and viscosity of the paintwork and the scumbling mirage-like veil through which we eagerly peer, half squinting in order to see beyond the surface. From the light source, which Le Brun considers is inside the painting at the back of the canvas, a horse and chariot ride treacherously toward us through the victorious laurel wreath. The imagery, like the horse and chariot, remains in flux, constantly shifting between victory and death, animal and fire, abstraction and figuration. Signed and dated u.l. verso, black fibre-tipped pen "Christopher/ Le Brun/ 1984".